If you’ve been around me for any length of time, you know I am a huge proponent for meal planning. I believe meal planning is crucial to the way my family functions. When I do not take the time to sit down and meal plan for the week, even on a small scale, it throws the week into chaos and I can’t seem to ever catch up. I take some time each Saturday and write out a meal plan for the upcoming week. I have gone through season where weekly meal planning works best for me. Right now, with the slower summer months, I am finding that monthly meal planning is ideal. Regardless of when you choose to meal plan or how many days you plan for, the important thing is to do it. You will be amazed at how much more productive you are, how much smoother your nights go and how much more streamlined your days seem. I wrote a post detailing how I meal plan, and included a weekly meal planning page if you want to check that out. I also have another version of a monthly meal plan with a weekly grocery list available you may like even more! 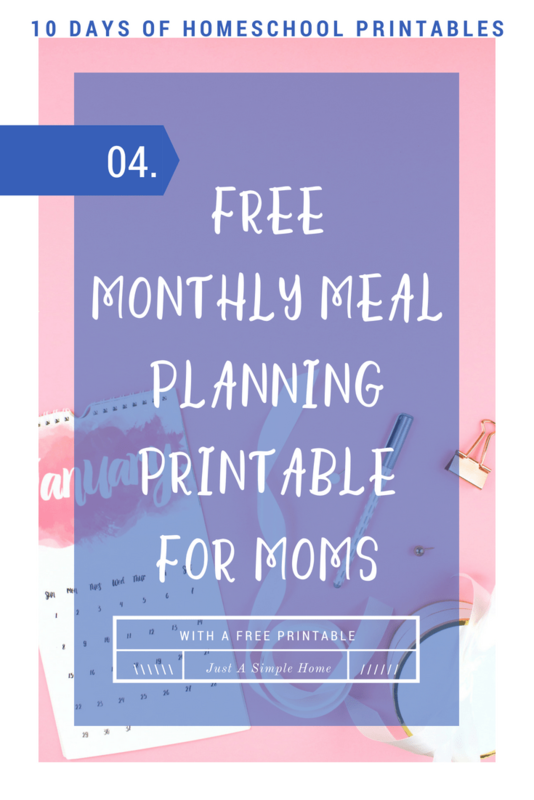 If you want to grab your monthly meal planning printable, you can do so below! Don’t forget to come back tomorrow and get your coordinating grocery list! Grab Your Meal Planning Printable! Download your free meal planning printable when you join our homeschool newsletter! Please check your inbox to confirm you want to join our homeschool community! You can look forward to free printables, tips for your homeschool journey and a free community for support! Download your Meal Planning Printable Here! This post is part of a 10 day series of Homeschool Printables! Click the button below to see all the posts and grab all your free printables! I really want to start meal planning and this will definitely help me with that. I love how pretty and feminine all of your printables are! I am exploring planning meals around daily themes. For example, Monday could be Italian night with choices of spaghetti, lasagna, or chicken parm. I’m still thinking through all this, but your printable will be very useful! Thank you! This is a great looking printable! Meal planning is so important to keeping our sanity as a busy mom!